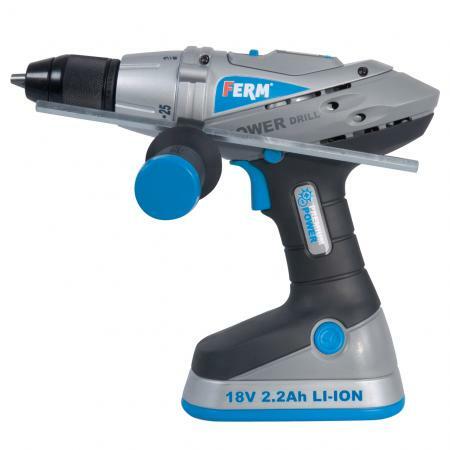 (Li-ion) which is used during the production of accumulators brings significant advantages to the users of the new series of FERM PREMIUM electric tools. 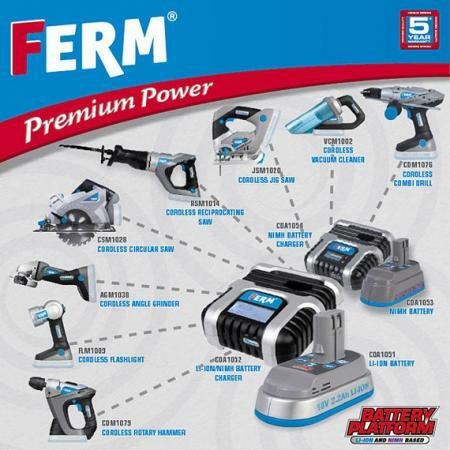 Due to the high energy the density batteries are very small and light with a high nominal voltage. Before first use it is not necessary to format them (repeatedly charging and discharging) and they do not have a “memory effect”. It is possible to charge them anytime irrespective of the level of charging without damage to the battery. Self-discharging is kept to the minimum, they retain up to 80% energy when not used during the whole year. The service life is 500 – 2,000 charging cycles. Inside the battery there is a chip which monitors the status of the course of charging. Li-ion batteries are maintenance-free; however with the correct use and storage it is possible to prolong their service life! The optimal storage is in cool places (not in the frost and at 40% charging). Do not leave the batteries to be fully discharged and do not store them for a long time fully charged or fully discharged.